We are in a time of unprecedented innovation and uncertainty. As technology advances at breakneck speed, society is asking thoughtful and legitimate questions about how these innovations will impact them, and what the role of business will be in ensuring a more equal and ethical future. 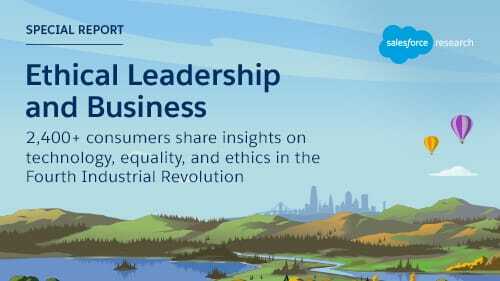 In an effort to better understand the changing expectations and behaviors of consumer and employees in the midst of massive societal shifts, Salesforce Research surveyed more than 2,400 individuals in the United States. Today, we share the results in a new report, Ethical Leadership and Business, with key findings around the role of business at the crossroads of ethics, technology, and equality. 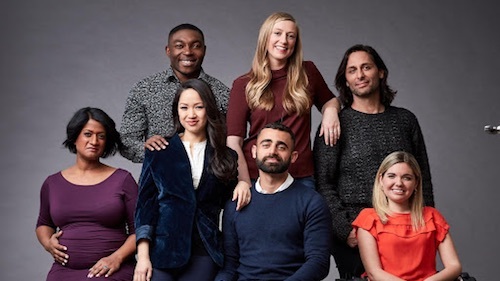 This report is one step on a longer journey of deep listening and action for Salesforce as we work together with our industry to pave a path forward. The research is personally meaningful because of my history in tech. When I first arrived in Silicon Valley, the optimistic energy was palpable. The general sentiment was that we, the tech industry, were the disruptors. We liked to say “move fast and break things” and it was all for this greater purpose of introducing the wonders of technology to the world — making everything better with this incredible, lightning-paced, larger than life innovation. In many ways, I think we all had on rose-colored glasses and were so focused on the horizon that the industry forgot to seriously consider that technology can have both positive and negative social impact. Fast-forward two decades and we are now on the edge of another era of unparalleled innovation in what we call the Fourth Industrial Revolution. We have a unique opportunity — and I would argue a responsibility — to learn from the past and be extremely thoughtful about how we as business and tech leaders engage with our communities and shape society. We can ensure that our footprint is actually bridging — not widening — equality gaps. Together we can build a more equal future and world for all. More and more, people demand increased accountability, action, and purpose from the companies they buy from and work for. According to our new research report, 93% of consumers say companies have a responsibility to look beyond profit and make a positive impact on the world — up from 80% in 2016. And we are seeing this sentiment evolve from traditional corporate social responsibility — people now look to companies to use their influence to drive tangible societal change. As we’ve seen before during pivotal moments in history, citizens are looking to businesses for not just action but even activism. Eighty-eight percent say businesses are responsible for fostering positive social change, and 87% say they are responsible for advocating for human rights. Leading with values and advocating for social good is not just the right thing to do, it’s also the smart thing. Brand loyalty is inextricably tied to ethics – 86% of consumers say they would be more loyal and 69% say they would spend more money with a company that demonstrates good ethics. We see similar expectations and trends when it comes to employees. Seventy-nine percent of employees would consider switching jobs if their current employer demonstrates poor ethics and 72% of the workforce say they want their companies to advocate for human rights. As we enter the Fourth Industrial Revolution, technology is woven into every aspect of our lives. However, many groups still live with limited access to the benefits and possibilities that technology brings. For example, many people across the globe live without internet access, limiting access to education, jobs, and more. This is what we call “the access gap” or the gap between disenfranchised groups — particularly people with disabilities, those of lower economic status, or underrepresented minorities — and those who tend to have more resources and opportunities in our society. At least two-thirds of consumers indicate some level of concern about whether people with disabilities, those of low socioeconomic status, those who live in rural locations, and underrepresented minorities — among other groups — are being afforded the same opportunities from emerging technologies as others. This widening digital divide not only creates inequalities across education, social mobility, and economic progress — it also creates a mindshare gap in our industries. Having diverse voices at the table helps us to ensure technologies are inclusive, serve all communities, and influence greater good. Sixty-five percent believe that including diverse perspectives in technology development yields better products. Close the access gap through training and nontraditional pathways: Ninety-six percent believe companies have a responsibility to prepare their existing workforce for the impact of emerging technologies on jobs, with 92% saying the same for the next generation. Consider adopting workforce development programs, like Year Up and Genesys works, or self-enablement platforms like Trailhead. These types of resources can help your company build alternative paths into tech careers and train the existing workforce for the jobs of tomorrow. Advocate for human rights and social good: The majority of consumers believe that companies have a responsibility to champion social good. 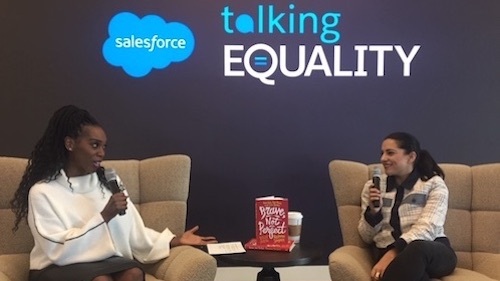 Learn more about how Salesforce approaches using our platforms for change to drive equality in our communities. Consider the social impact of their products by prioritizing Ethical and Humane technology: Fifty-one percent of consumers are more worried about technology’s ethical issues than they were a year ago. At Salesforce, we started on a path toward ethical and humane use by deeply listening to our stakeholders’ concerns and hopes for technology’s societal impact, convening multi-stakeholder dialogues about the state of the industry, building a diverse council to help guide our actions, and establishing our first-ever Office of Ethical and Humane Use of technology. It’s still early days, and we are committed to approaching everything with a beginner’s mindset. Learn more here. As an industry, we have a unique opportunity to lead at a critical moment in society. Technology has the power to be a force for good in our world — or harm. 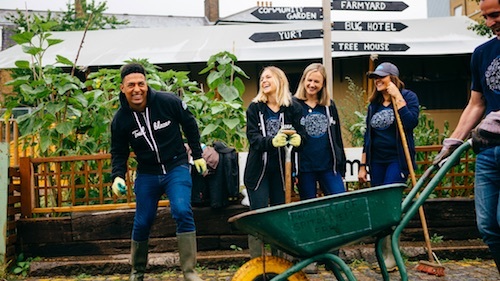 As Salesforce Co-CEO and Chairman Marc Benioff says: “We know that technology is not inherently good or bad; it's what we do with it that matters.” The responsibility rests on us to ensure we are building a better world for all. We have the power to create meaningful change — let's pave this path together.